What inspires me about Marian and Scott’s story is how they handled growth and change. Initially, Marian in her 2011 Experience Report, Applying Agile to Instructional Design, describes how their 3-person team, following agile practices, got very efficient with delivering high-quality online courses. But with success came new responsibilities. In 2014 their small, tight team, was rechartered and a whole new organization grew around them. They found themselves leading a much larger endeavor. 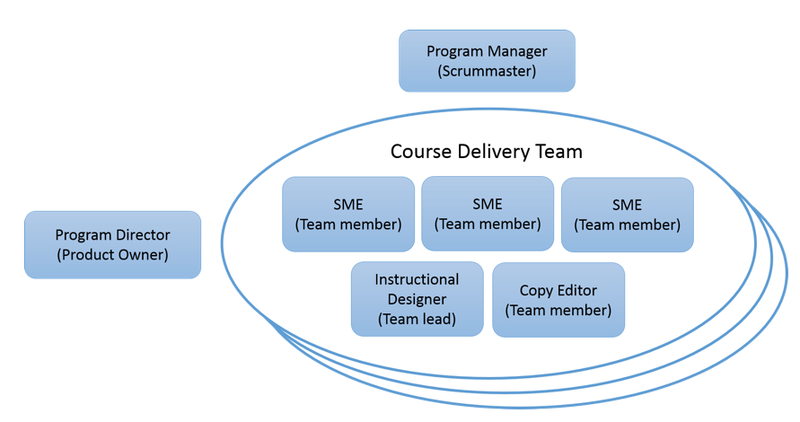 First, they beta tested a new way of curriculum development with roles and responsibilities of the Scrummaster, Product Owner and Team Members mapped from Scrum onto curriculum design [figure 1]. Marian and Scott are not alone. Others have successfully translated software development principles and practices into non-software realms. Gaetano Mazzanti, an agile software coach, took what he knew about lean and scrum to improve the engineering and design process at an Italian company producing luxury hydromassage bathtubs and showers [2012 Experience Report: Agile in the Bathtub]. Paul Ellerby [2013 Experience Report: Balls for Africa - The Lean Startup in an African not-for-profit social enterprise] helped Alive and Kicking grow from a small, single-focused non-profit into an enterprise that effected the lives of hundreds of children throughout Africa. And Thomas O’Connor took his passion and agile experiences to his local community [2014 Experience Report: Taking the Agile Passion to a Volunteer Fire Department-A Report From The Fireline].